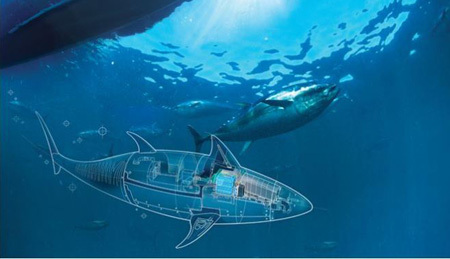 GhostSwimmer, derived from the BIOSwimmer, is a robotic tuna fish unmanned underwater vehicle developed for underwater surveillance by Weltham MA. based by Boston Engineering. 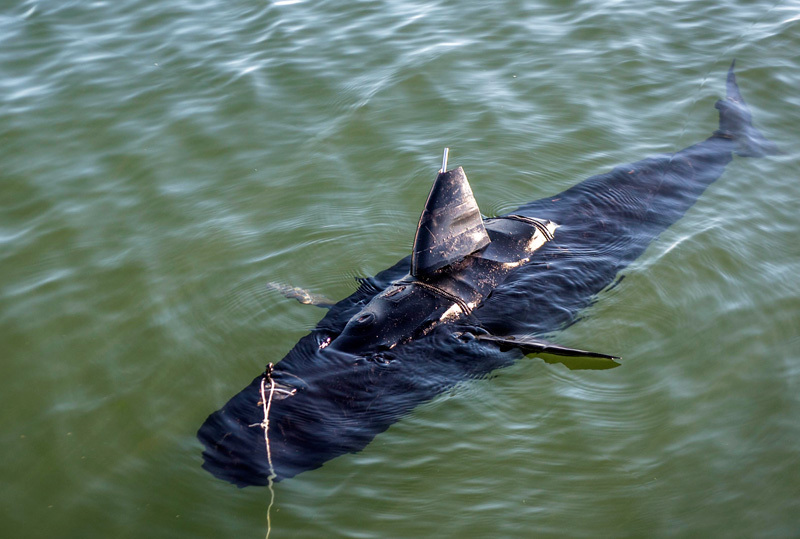 The U.S. Navy completed tests on the GhostSwimmer unmanned underwater vehicle (UUV) at Joint Expeditionary Base Little Creek-Fort Story (JEBLC-FS) this week. GhostSwimmer is the latest in a series of innovative projects developed under project ‘Silent NEMO’ Rapid Innovation Cell (CRIC). The GhostSwimmer was developed to resemble the shape and mimic the swimming style of a large fish. At a length of approximately 1.5 meters (5 feet) and a weight of nearly 45kg. (100 pounds), the GhostSwimmer vehicle can operate in water depths ranging from 0.25 to 90 meters (10 inches to 300 feet). Its bio-mimicry provides additional security during low-visibility intelligence, surveillance and reconnaissance (ISR) missions and friendly hull inspections, while quieter than propeller driven craft of the same size, according to Navy Warfare Development Command (NWDC). 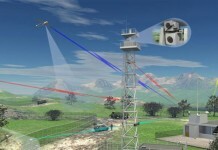 The robot is capable of operating autonomously for extended periods of time due to its long-lasting battery, but it can also be controlled via laptop with a 152 m’ (500-foot) tether. The tether is long enough to transmit information while inspecting a ship’s hull, for example, but, if operating independently (without a tether), the robot will have to periodically be brought to the surface periodically to download its data. Silent NEMO is an experiment that explores the possible uses for biomimetic, unmanned underwater vehicles developed under the Chief of Naval Operation Rapid Innovation Cell (CIRC). 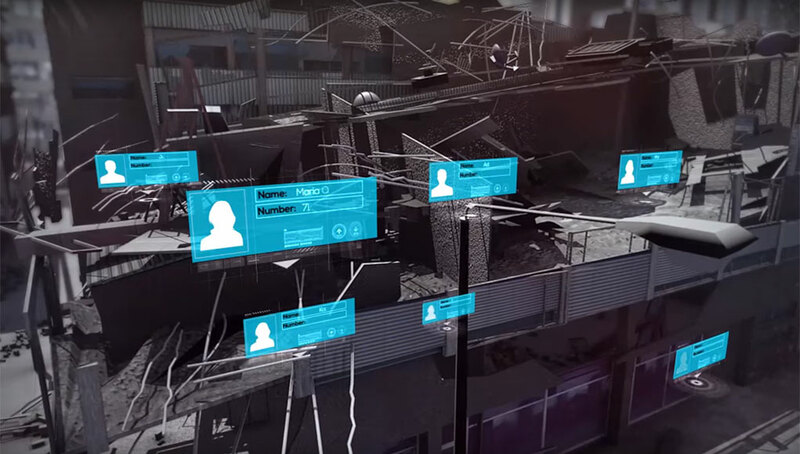 The CRIC was established in 2012 to provide junior leaders with an opportunity to identify and rapidly field emerging technologies that address the Navy’s most pressing challenges, and it aims to find ways to quickly employ them. 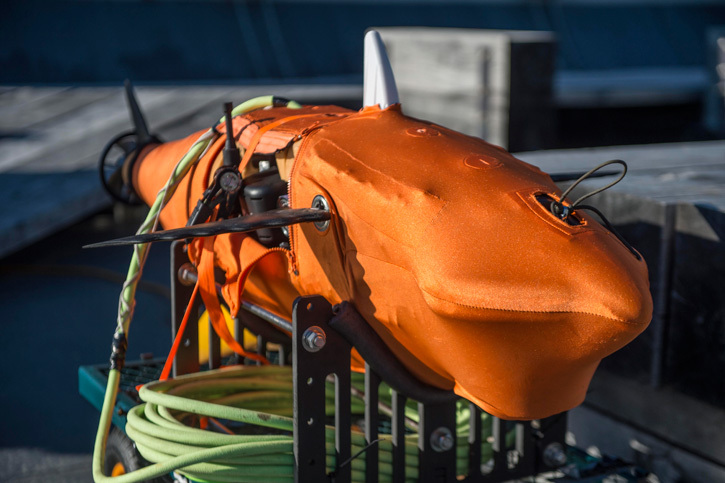 A similar project undertaken by Boston Engineering is the ‘BIOSwimmer’, a six-foot-long robotic fish designed to detect contraband hidden on a ship’s hull. 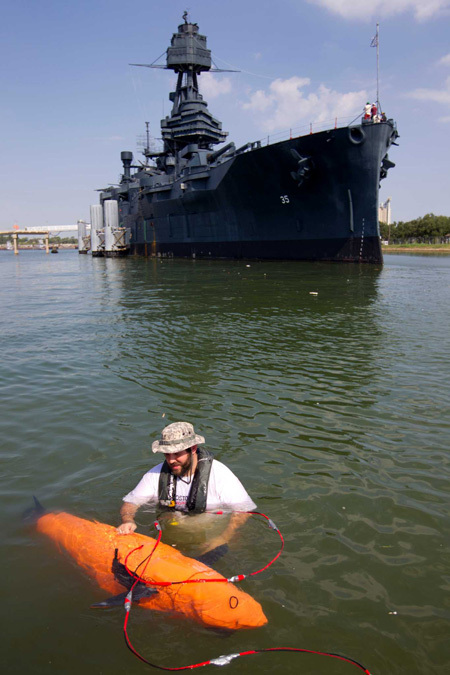 For this mission the ‘fish’ was equipped with a sophisticated sensor suite, demonstrated last year on the Battleship Texas berthed in Houston TX, as part of a collaborative exercise of the Texas Parks and Wildlife Department, and the Department of Homeland Security’s Science and Technology Directorate. 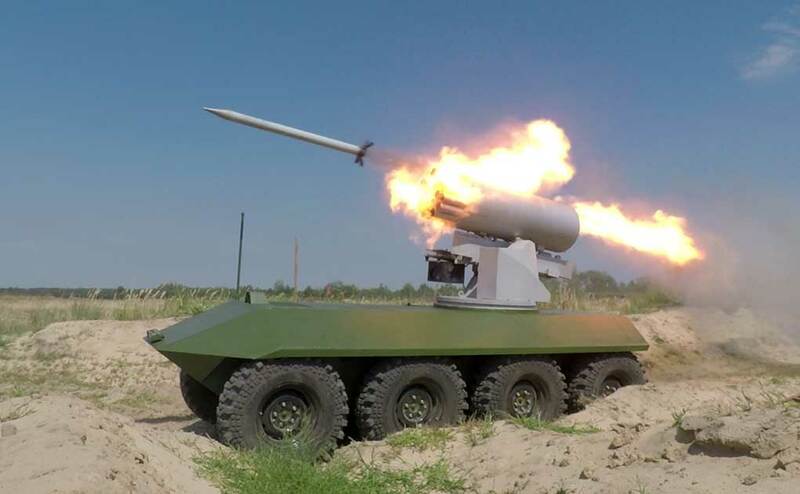 The robotic fish was used to detect packages of mock contraband of varying sizes placed by testers in hard-to-reach spaces on the battleship’s hull. The development of the system was funded by DHS Science & Technology Small Business Innovation Research funding.